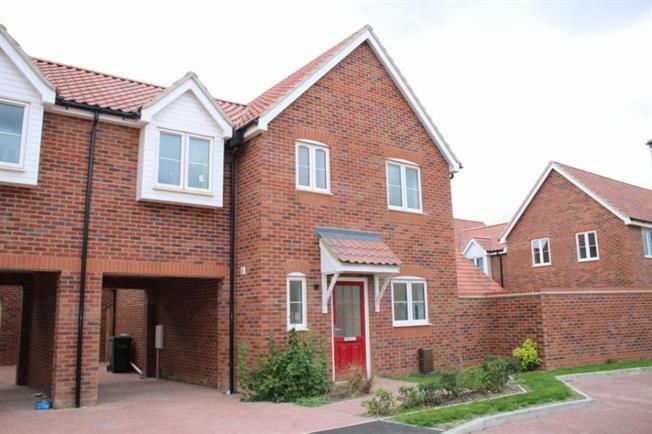 4 Bedroom Link Detached House For Sale in Bury St. Edmunds for £270,000. The Cornflower Plot 24 is a brand new beautifully presented 4 bedroom link detached house (1077 sqft) brought to you by 'Laurence Homes' including integrated appliances, fully enclosed turfed rear gardens, carpets throughout the house and highly efficient air source heat pump. The property includes Kitchen with integrated appliances, lounge/diner, downstairs w/c, four bedrooms with en-suite to the master, family bathroom and upstairs storage. The Kitchen includes a choice of fitted kitchen units including electric oven, electric hob, integrated hood extractor, plumbing for automatic washing machine, plumbing for dishwasher and co-ordinated cushion flooring too. The Bathroom boasts from a fully tiled bath area, half tiled to sanitary ware walls, thermostatic mixer shower valve, white sanitary ware, co-ordinated wall tiling. The en-suite includes fully tiled shower cubicle, thermostatic mixer shower valve and half tiled to sanitary ware walls. Included in this fantastic property is a large single garage and generous off street parking. You will find TV points to all bedrooms and lounge, telephone points to all bedrooms, lounge and hall, UPVC double glazed windows, fibreglass roof insulation, block paved driveway and security locks to all external doors. Being a brand new property you can also have piece of mind with the fantastic 10 year NHBC 'Buildmark' warranty too!